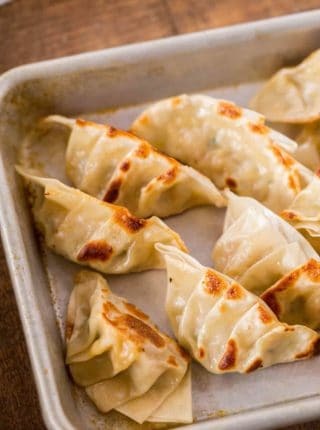 Egg Rolls and the PERFECT crispy appetizers, made with chicken, cabbage, carrots, mushrooms, and seasoning wrapped in egg roll wrappers and fried, ready in 30 minutes! 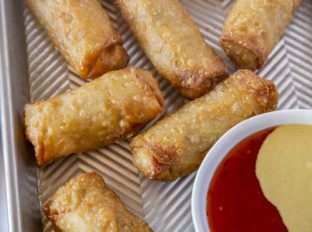 We love these crispy egg rolls because they’re just as good as any takeout appetizer, but you can make them at home. 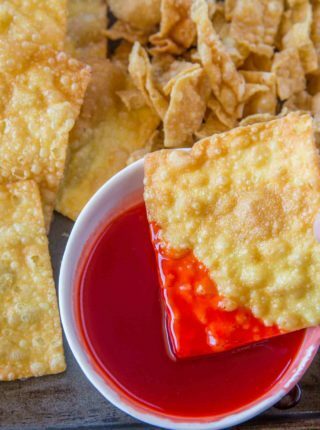 Pair them with our Spring Rolls, Crab Rangoon, and Potstickers for a full dim sum dinner and dip them in our Sweet and Sour Sauce! Egg Rolls are definitely a favorite appetizer in this house, made with ground chicken, spices, and vegetables in egg roll wrappers and fried until they’re golden brown and crispy. You can use ground pork or beef for these, too. This recipe takes a total time of 30 minutes to make. I like to make extra and freeze them, for a faster option next time I’m craving these. Plus I love making these ahead and serving them up when we make Panda Express Orange Chicken and Classic Fried Rice. You can make this egg rolls recipe using pre-shredded cabbage (or packaged slaw mix) if you want to cut some of the prep time down. We like to dip these in homemade sweet and sour sauce, extra soy sauce, or with a little bit of sriracha for heat. Homemade egg rolls are a definite must when we’re cooking Chinese food, and beats take-out any day of the week! ARE EGG ROLLS THE SAME AS SPRING ROLLS? 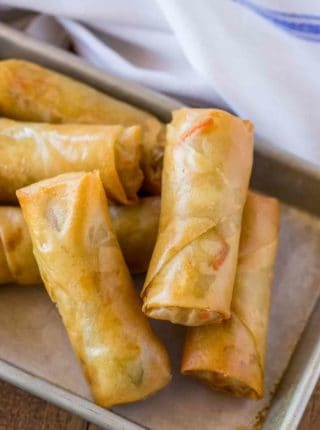 Egg rolls and spring rolls can use a similar filling depending on the recipe, but the main difference is that spring rolls use a thinner rice flour wrapper, while egg rolls us a wheat flour wrapper that is thicker. Spring roll wrappers are usually translucent while egg roll wrappers are crispy and brown. Egg rolls are also fried, while spring rolls can be steamed or fried. Spring rolls often have lighter ingredients, like vegetables or seafood, too. If you want to enjoy spring rolls the recipe is here on the site too! I linked to them above. Egg rolls may get their name from the wrapper, which is sometimes (but not always) made from a mixture of eggs and wheat flour. But the actual origin of the name is still up for debate. WHAT CAN YOU ADD TO MAKE THESE VEGETABLE EGGROLLS? 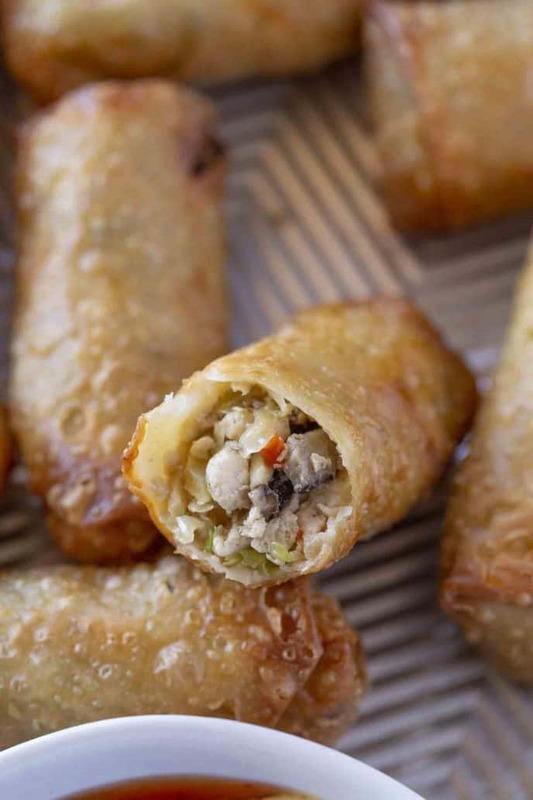 If you want a vegetarian version of these egg rolls, omit the meat and add more vegetables to the filling. Here are my favorite suggestions. Egg rolls are always best when served right away. You can store leftover eggrolls in an airtight container in the refrigerator for 2-3 days. Or freeze egg rolls for another day by wrapping them tightly in an ziplock bag and aluminum foil. 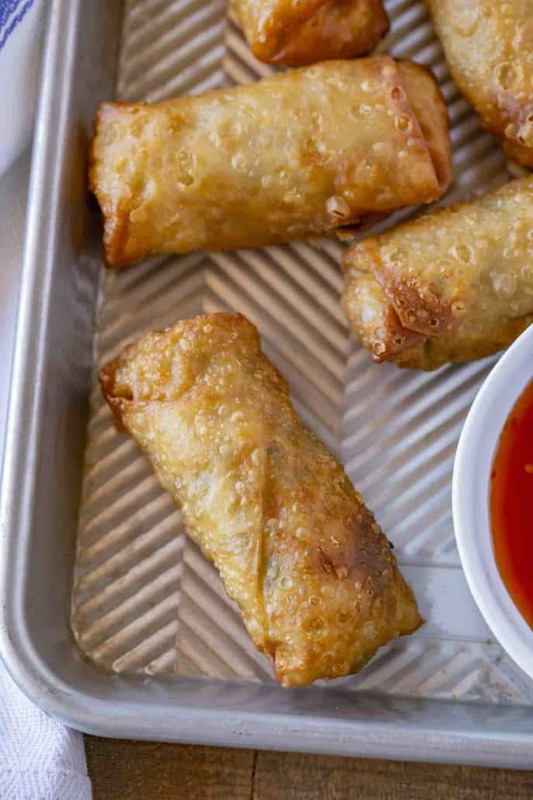 This egg rolls recipe will last in the freezer for 3-4 months. Reheat in the oven at 400 degrees F until warmed through before eating, or fry them again for a few minutes. You can substitute soy sauce with low sodium tamari or coconut aminos, which taste the same as soy sauce. Add some chopped green onions right before rolling these egg rolls for fresh flavor. Or top with green onions for decoration before serving. You can also make Chinese egg rolls with beef, ground pork, shrimp, or tofu, depending on your preference. You can use red or green cabbage for this recipe, or a mix of both, if that’s what you have. Serve these with other appetizers like P.F. Chang’s Chicken Lettuce Wraps (Copycat) or Korean Ground Beef Egg Rolls. Make these lighter by placing on a parchment paper lined baking sheet and spraying with cooking oil. Then bake at 400 degrees F for 10-15 minutes, turn over and bake an additional 10-15 minutes. For extra crispiness in your egg rolls, turn on the broiler for the last minute or two until golden brown. 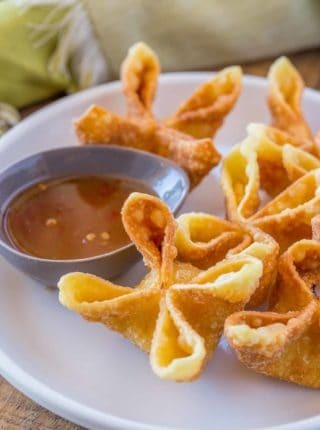 Place these egg rolls on a cooling rack with paper towels under it to catch any oil that drips off. Putting them directly onto the paper towels may cause the bottoms to steam and get soggy. Add the chicken, ginger and garlic to a large skillet on medium heat and cook until fully cooked through, about 4-5 minutes. Remove the chicken and add in the vegetable oil, cabbage, mushrooms and carrots and cook for 3-4 minutes until wilted, turn the heat off, add the chicken back in and mix well then let cool for 10 minutes before adding to the wrappers. To each wrapper add 1/4 cup of the cooled filling, with a wet finger wipe water along the edges, fold in the sides and roll the egg roll closed. When ready to fry add 3 inches of vegetable oil to a large dutch oven and heat to 375 degrees, then fry until golden brown (the inside is cooked, you only need to brown the outsides) then cool on a cooling rack. The filling was delicious! My crew even liked experimenting with eating them “fresh” with the rice paper wraps (since that is what I had to use.) They came back for seconds. Thanks! Oh yum!!! You make it look so easy to make egg rolls at home. It really is easy, Becky! Thank you so much for this recipe. 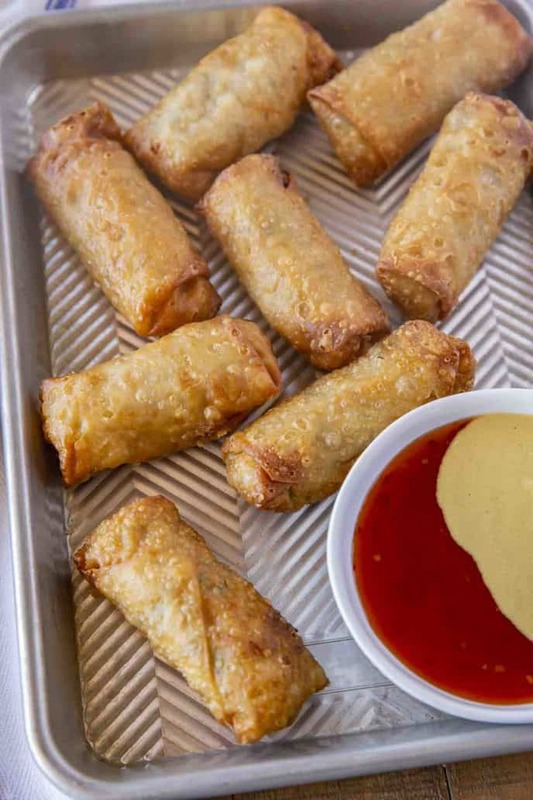 We love making our own takeout at home and egg rolls are one food we needed to add! So delicious! Love all the tips to make them perfect! So glad you enjoyed them, Courtney! I had never thought about making these at home, until now! Holy smokes… amazing! I’m a huge egg roll fan and these did not disappoint! Will make again. Yay!! Thanks for coming back to let me know how much you enjoyed them.